Happy Purim! Chag Purim Sameach! To be completely honest, I wasn't sure I'd even get around to making homemade hamentaschen this year. But there's something about this annual tradition that if missed, would make the holiday feel a little empty for me. So I did it. But I didn't go back to one of the fantastic recipes I'd made in the past (here, here, and here). I wanted to use this once-a-year opportunity to choose a recipe from a different cookbook. So I sifted through my Jewish dessert cookbooks and decided on Gil Marks ' The World of Jewish Desserts. His dough was fantastic. Easy to work with, beautifully flecked with orange zest, and held its shape when baked. I chose to make three fillings: apricot, chocolate, and poppy seed. But I did an interesting thing before I ended up with those filling choices. I posted an unofficial poll to my Facebook page. 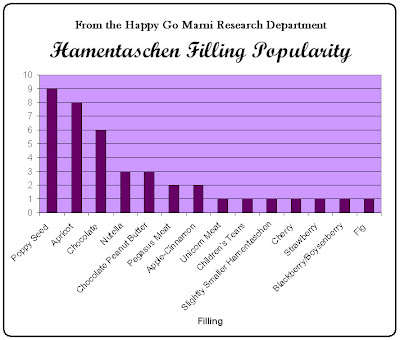 Apparently my friends have very strong, passionate feelings toward their hamentaschen fillings! 37 comments later, I had a fair amount of data. A couple of peculiar votes like pegasus meat, children's tears, and smaller hamentaschen (that is pure genius) made their way onto the list, but mostly it was your usual chocolate, fruit, and poppy seed filling votes. 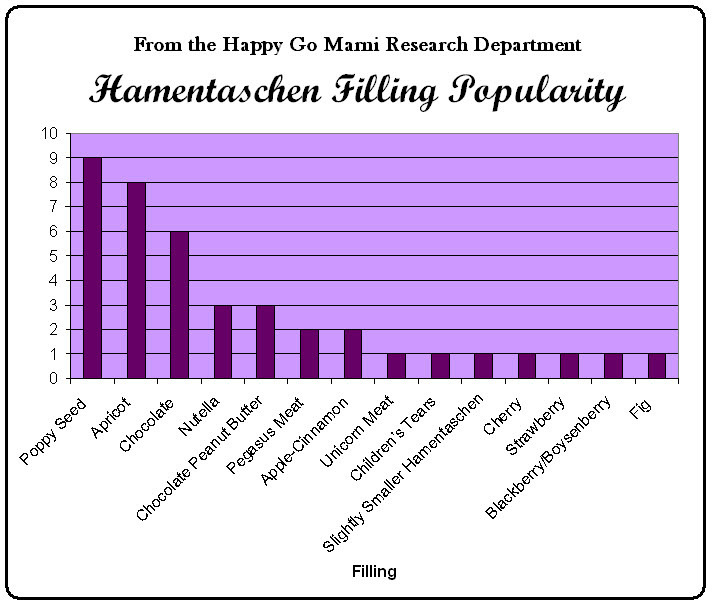 What's your favorite hamentaschen filling? Sift the dry ingredients together: the flour, baking powder, and salt. In a stand mixer, beat the butter or margarine until smooth, about 1 minute. With the mixer on low speed, slowly add the sugar until the mixture is light and fluffy, about 4 minutes. Beat in the eggs, one at a time. Add the liquid (orange juice, milk, or water), extract, and optional zest. On low speed, add in the flour just until combined. The dough will be soft, not too dense. Wrap in plastic and chill in the fridge until firm, about 2 hours. You can leave it overnight, too. When you're ready to shape the dough, remove from the fridge and let sit out a few minutes to become malleable (won't take very long because it's a soft dough). Preheat the oven to 350 degrees F. Divide the dough into thirds. Return the other two chunks to the fridge so they don't get too soft. With the remaining third, roll it out with a rolling pin on a lightly floured dough board or waxed paper to about 1/8 inch thick. If you prefer thicker dough, roll to about 3/8 inch thick. Using a 2 1/2 or 3-inch round cookie cutter, cut circles out of the dough. Save the scraps to roll out again and make more cookies. Place 1 teaspoon of filling in the center of each round. Bring three corners of each round up toward the top, pinching two points together to form one corner, then continuing until you have three corners. I like to leave some of the filling exposed, not only because it's pretty to see some color peeking out, but because then you'll know which filling it has if you are making more than one filling! If when you pinch the edges together they don't stick well, rub a little cold water on the dough to act as glue. Place 1 inch apart on parchment or silicone baking mat-lined baking sheets. Prepare Golden Egg Wash (see recipe below). Brush egg wash on all sides of each unbaked cookie with a pastry brush. Sprinkle with coarse sugar if you'd like. Bake until golden, 15-20 minutes depending on your oven. I prefer my cookies a little chewy, so I err on the side of less baking time. Transfer to a rack to cool. Store in an airtight container at room temperature. The cookies will keep for about one week, or you can freeze them as soon as they've cooled and they'll be good for several months. In a small bowl, whisk together all the ingredients. Use a pastry brush to glaze or brush on prepared, unbaked hamentaschen. Hmmm, I think I like your graph more than your hamentaschen, if that is even possible! :-) I love your graph...it may be the first it's kind. Your dough looks fabulous, too! And my favorite is poppy seed filling. But I added cocoa, orange and lemon zest, and walnuts to my poppy seeds, ala Carole Walter. Thanks for doing the research!! Apricot would be my first choice, but after that I'd go with the one brave soul who chose fig. Yum! Wow, poppy seed beat my fave apricot? And poor fig was so low in the standings. Sigh. I have to say I love your scientific chart. Now, those are some mighty delicious findings.